Cars in all shades of green are a red-hot topic for the automobile market, and (in my opinion) they make for seductive headlines. Speaking for myself I’m constantly distracted by news articles featuring shiny auto show concept car images and stories touting the newest manufacturer’s plans to jump on the plugged-in-hybrid-nontraditionally-fueled-gazillion-mpg-bandwagon. 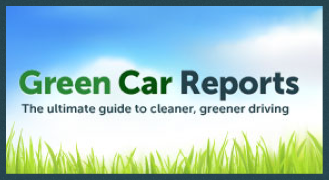 If you want to delve beyond the occasionally distracting article breaking up your regular mix of headlines and more closely follow this market, then check out Green Car Reports which, as the name suggests, is a veritable hoard of relevant industry news. Unfortunately the site is a bit cumbersome to browse, and it lacks an advanced search page, with only a lonesome Google custom search box at this moment, but considering the concentration of all topics related to the green auto business (the News section currently has 270 pages of articles with 15 headlines per page), it’s a forgivable sin. Navigation tip: type the keyword infographic in the search box and you can view a handful of reports and articles that include eye-catching high-resolution images of interesting data spreads, for example, people in which cities are spending the most on fuel? Just like the industry its following, this site may need some tweaks and upgrades, but it’s definitely headed in the right direction.